Hebrew (עִבְרִית‎ or עברית‎, ‘Ivrit) is a Semitic language of the Afro-Asiatic language family spoken by more than seven million people in Israel and Jewish communities around the world. In Israel, it is the de facto language of the state and the people, as well as being one of the two official languages (together with Arabic), and is spoken by a majority of the population. The core of the Tanakh (the Hebrew Bible) is written in Classical Hebrew, and much of its present form is specifically the dialect of Biblical Hebrew that scholars believe flourished around the 6th century BCE, near the Babylonian exile. For this reason, Hebrew has been referred to by Jews as Lĕshôn Ha-Kôdesh (לשון הקודש‎), "The Sacred Tongue", since ancient times. Most linguists agree that after the 6th century BCE when the Neo-Babylonian Empire destroyed Jerusalem and exiled its population to Babylon and the Persian Empire allowed them to return, the Biblical Hebrew dialect prevalent in the Bible came to be replaced in daily use by new dialects of Hebrew and a local version of Aramaic. After the 2nd century CE when the Roman Empire exiled the Jewish population of Jerusalem and parts of the Bar Kokhba State, Hebrew gradually ceased to be a spoken language, but remained a major literary language. Letters, contracts, commerce, science, philosophy, medicine, poetry, and laws were written in Hebrew, which adapted by borrowing and inventing terms. Hebrew, long nearly extinct outside of Jewish liturgical and scholarly purposes, was revived as a literary and narrative language by the Haskalah (Enlightenment) movement of the mid-19th century. Near the end of that century the Jewish linguist Eliezer Ben-Yehuda, owing to the ideology of Zionism, began reviving Hebrew as a modern spoken and written language. Eventually it replaced a score of languages spoken by Jews at that time, such as Ladino (also called Judezmo), Yiddish, Russian, and other languages of the Jewish diaspora. Because of its large disuse for centuries, Hebrew lacked many modern words. Several were adapted as neologisms from the Hebrew Bible or borrowed from other languages by Eliezer Ben-Yehuda. Modern Hebrew became an official language in British-ruled Palestine in 1921 (along with English and Arabic), and then in 1948 became an official language of the newly declared State of Israel. As a language, Hebrew refers to one of several dialects of the Canaanite language. Hebrew (Israel) and Moabite (Jordan) can be called Southern Canaanite dialects while Phoenician (Lebanon) can be called a Northern Canaanite dialect. Canaanite is closely related to Aramaic and to a lesser extent South-Central Arabic. Whereas other Canaanite dialects have become extinct, Hebrew survived. Hebrew flourished as a spoken language in Israel from the 10th century BCE until just before the Byzantine Period in the 3rd or 4th century CE. (See below, Aramaic displacing Hebrew as a spoken language.) Afterward Hebrew continued as a literary language until the Modern Era when it was revived as a spoken language in the 19th century. Hebrew is a Semitic language, and as such a member of the larger Afro-Asiatic phylum. Proto-Semitic was probably spoken around the 4th millennium BC in the Arabian peninsula. Within Semitic, the Northwest Semitic languages formed around the 3rd millennium BCE, grouped with the Arabic languages as Central Semitic. The Canaanite languages are a group within Northwest Semitic, emerging in the 2nd millennium BC in the Levant, gradually separating from Aramaic and Ugaritic. Within the Canaanite group, Hebrew belongs to the sub-group also containing Edomite, Ammonite and Moabite: see Hebrew languages. Another Canaanite sub-group contains Phoenician and its descendant Punic. The first written evidence of distinctive Hebrew, the Gezer calendar, dates back to the 10th century BCE at the beginning of the Monarchic Period, the traditional time of the reign of David and Solomon. Classified as Archaic Biblical Hebrew, the calendar presents a list of seasons and related agricultural activities. The Gezer calendar (named after the city in whose proximity it was found) is written in an old Semitic script, akin to the Phoenician one that through the Greeks and Etruscans later became the Roman script. The Gezer calendar is written without any vowels, and it does not use consonants to imply vowels even in the places where later Hebrew spelling requires it. The Shebna lintel, from the tomb of a royal steward found in Siloam, dates to the 7th century BCE. Numerous older tablets have been found in the region with similar scripts written in other Semitic languages, for example Protosinaitic. It is believed that the original shapes of the script go back to the hieroglyphs of the Egyptian writing, though the phonetic values are instead inspired by the acrophonic principle. The common ancestor of Hebrew and Phoenician is called Canaanite, and was the first to use a Semitic alphabet distinct from Egyptian. One ancient document is the famous Moabite Stone written in the Moabite dialect; the Siloam Inscription, found near Jerusalem, is an early example of Hebrew. Less ancient samples of Archaic Hebrew include the ostraka found near Lachish which describe events preceding the final capture of Jerusalem by Nebuchadnezzar and the Babylonian captivity of 586 BCE. In its widest sense, Classical Hebrew means the spoken language of ancient Palestine flourishing between the 10th century BCE and the turn of the 4th century CE. It comprises several evolving and overlapping dialects. The phases of Classical Hebrew are often named after important literary works associated with them. Archaic Biblical Hebrew from the 10th to the 6th century BCE, corresponding to the Monarchic Period until the Babylonian Exile and represented by certain texts in the Hebrew Bible ( Tanakh), notably the Song of Moses (Exodus 15) and the Song of Deborah (Judges 5). Also called Old Hebrew or Paleo-Hebrew. Historically, it used a form of the Canaanite script. Biblical Hebrew around the 6th century BCE, corresponding to the Babylonian Exile and represented by the bulk of the Hebrew Bible that attains much of its present form around this time, give-or-take. Also called Classical Biblical Hebrew (or Classical Hebrew in the narrowest sense). It adopted the Imperial Aramaic script. Late Biblical Hebrew from the 6th to the 4th century BCE, that corresponds to the Persian Period and is represented by certain texts in the Hebrew Bible, notably the books of Ezra and Nehemiah. Dead Sea Scroll Hebrew from the 3rd century BCE to the 1st century CE, corresponding to the Hellenistic and Roman Periods before the destruction of the Temple in Jerusalem and represented by the Qumran Scrolls that form most (but not all) of the Dead Sea Scrolls. Commonly abbreviated as DSS Hebrew, also called Qumran Hebrew. The Imperial Aramaic script of the earlier scrolls in the 3rd century BCE evolved into the Hebrew square script of the later scrolls in the 1st century CE, still in use today. Sometimes the above phases of spoken Classical Hebrew are simplified into "Biblical Hebrew" (including several dialects from the tenth century BCE to 2nd century BCE and extant in certain Dead Sea Scrolls) and "Mishnaic Hebrew" (including several dialects from the 3rd century BCE to the 3rd century CE and extant in certain other Dead Sea Scrolls). However today, most Hebrew linguists classify Dead Sea Scroll Hebrew as a set of dialects evolving out of Late Biblical Hebrew and into Mishnaic Hebrew, thus including elements from both but remaining distinct from either. By the start of the Byzantine Period in the 4th century CE, Classical Hebrew ceases as a spoken language, roughly a century after the publication of the Mishnah, apparently declining since the aftermath of the catastrophic Bar Kokhba War around 135 CE. The term Rabbinic Hebrew generally refers to the Hebrew dialects found in the Talmud תלמוד‎, excepting quotations pulled from the Hebrew Bible. The dialects organize into Mishnaic Hebrew (also called Tannaitic Hebrew, Early Rabbinic Hebrew, or Mishnaic Hebrew I), which was a spoken language, and Amoraic Hebrew (also called Late Rabbinic Hebrew or Mishnaic Hebrew II), which was a literary language. The earlier section of the Talmud is the Mishnah משנה‎ that was published around 200 CE and was written in the earlier Mishnaic dialect. The Talmud also adds the Tosefta תוספתא‎ being other texts from this dialect. The dialect is also found in certain Dead Sea Scrolls. Mishnaic Hebrew is considered one of the dialects of Classical Hebrew that functioned as a living language in the land of Israel. About a century after the publication of the Mishnah, Mishnaic Hebrew fell into disuse as a spoken language. The later section of the Talmud, the Gemara גמרא‎, generally comments on the Mishnah and Tosefta in Aramaic. Nevertheless, Hebrew survived as a liturgical and literary language in the form of later Amoraic Hebrew, which sometimes occurs in the text of the Gemara. After the Talmud, various regional literary dialects of Medieval Hebrew evolve. The most important is Tiberian Hebrew or Masoretic Hebrew, a local dialect of Tiberias in Galilee that becomes the standard for vocalizing the Hebrew Bible and thus influences all other regional dialects of Hebrew. This Tiberian Hebrew from the 7th to 10th century CE is sometimes called "Biblical Hebrew" because it is used to pronounce the Hebrew Bible, however properly it should be distinguished from the historical Biblical Hebrew of the 6th century BCE, whose original pronunciation must be reconstructed. Tiberian Hebrew incorporates the remarkable scholarship of the Masoretes (from masoret meaning "tradition"), who add vowel points and grammar points to the Hebrew letters to preserve much earlier features of Hebrew, for use in chanting the Hebrew Bible. The Masoretes inherited a biblical text whose letters were considered too sacred to be altered, so their markings were in the form of pointing in and around the letters. The Syriac script, precursor to the Arabic script, also developed vowel pointing systems around this time. The Aleppo Codex, a Hebrew Bible with the Masoretic pointing, was written in the 10th century likely in Tiberias and survives to this day. It is perhaps the most important Hebrew manuscript in existence. Mizrahi (Oriental) Hebrew is actually a collection of dialects spoken liturgically by Jews in various parts of the Arab and Islamic world. It was possibly influenced by the Aramaic and Arabic languages, and in some cases by Sephardi Hebrew, although some linguists maintain that it is the direct heir of Biblical Hebrew and thus represents the true dialect of Hebrew. The same claim is sometimes made for Yemenite Hebrew or Temanit, which differs from other Mizrahi dialects by having a radically different vowel system. In the Modern Period, from the 19th century onward, the literary Hebrew tradition as pronounced in Jerusalem revived as the spoken language of modern Israel, called variously Israeli Hebrew, Modern Israeli Hebrew, Modern Hebrew, New Hebrew, Israeli Standard Hebrew, Standard Hebrew, and so on. Israeli Hebrew exhibits many features of Sephardic Hebrew from its local Jerusalemite tradition but adapts it with numerous neologisms and borrows (often technical) terms from European languages and (often colloquial) terms from Palestinian Arabic to function as a modern language. The literary and narrative use of Hebrew was revived beginning with the Haskalah (Enlightenment) movement of the mid-19th century, with the publication of several Eastern European Hebrew-language newspapers (e.g. HaMagid, founded in Lyck, Prussia, in 1856). Prominent poets were Chaim Nachman Bialik and Saul Tshernikovsky; there were also novels written in the language. The revival of Hebrew language as a mother tongue was initiated by the efforts of Eliezer Ben-Yehuda ( 1858- 1922) (אליעזר בן–יהודה‎). He joined the Jewish national movement and in 1881 immigrated to Palestine, then a part of the Ottoman Empire. Motivated by the surrounding ideals of renovation and rejection of the diaspora " shtetl" lifestyle, Ben-Yehuda set out to develop tools for making the literary and liturgical language into everyday spoken language. However, his brand of Hebrew followed norms that had been replaced in Eastern Europe by different grammar and style, in the writings of people like Achad Ha-Am and others. His organizational efforts and involvement with the establishment of schools and the writing of textbooks pushed the vernacularization activity into a gradually accepted movement. It was not, however, until the 1904-1914 " Second aliyah" that Hebrew had caught real momentum in Ottoman Palestine with the more highly organized enterprises set forth by the new group of immigrants. When the British Mandate of Palestine recognized Hebrew as one of the country's three official languages (English, Arabic, and Hebrew, in 1922), its new formal status contributed to its diffusion. A constructed modern language with a truly Semitic vocabulary and written appearance, although often European in syntax and form, was to take its place among the current languages of the nations. While many saw his work as fanciful or even blasphemous (due to the fact that Hebrew was the holy language of the Torah and therefore some thought that it should not be used to discuss common everyday matters), many soon understood the need for a common language amongst Jews of the Palestine Mandate who at the turn of the 20th century were arriving in large numbers from diverse countries and speaking different languages. However, it has been said that Hebrew unified the new immigrants coming to Mandate Palestine, creating a common language and "culture." A Committee of the Hebrew Language was established. Later it became the Academy of the Hebrew Language, an organization that exists today. The results of his and the Committee's work were published in a dictionary (The Complete Dictionary of Ancient and Modern Hebrew). Ben-Yehuda's work fell on fertile ground, and by the beginning of the 20th century, Hebrew was well on its way to becoming the main language of the Jewish population of both Ottoman and British Palestine. The Soviet authorities considered the use of Hebrew "reactionary" since it was associated with both Judaism and Zionism, and the teaching of Hebrew at primary and secondary schools was officially banned by the Narkompros (Commissariat of Education) as early as 1919, as part of an overall agenda aiming to secularize education (the language itself didn't cease to be studied at universities for historical and linguistic purposes). The official ordinance stated that Yiddish, being the spoken language of the Russian Jews, should be treated as their only national language, while Hebrew was to be treated as a foreign language. Hebrew books and periodicals ceased to be published and were seized from the libraries, although liturgical texts were still published until the 1930s. Despite numerous protests in the West, teachers and students who attempted to study the Hebrew language were pilloried and sentenced for "counter revolutionary" and later for "anti-Soviet" activities. in popular speech, penultimate stress in proper names (Dvóra instead of Dĕvorá; Máhane Yehúda instead of Mahané Yĕhudá). Scholars differ on the characterization of the resulting language. Most regard it as a genuine continuation of Biblical and Mishnaic Hebrew, while conceding that it has acquired some European vocabulary and syntactical features, in much the same way as Modern Standard Arabic. Wexler claims that modern Hebrew is not a Semitic language at all, but a dialect of "Judaeo-Sorbian". On his argument, the underlying structure of the language is Slavic, "re-lexified" to absorb much of the vocabulary and inflexional system of Hebrew, in the same way as a creole. Ghilad Zuckermann takes an intermediate view: "Israeli" is a separate language from Hebrew, and has a basically European syntax, but should be regarded as a hybrid between the Hebrew and European models. The identity of the European substrate has varied: in the time of the Mandate and the early state, the principal contributors were Yiddish and modern standard German, while today it is American English. Immigrants to Israel are encouraged to adopt Israeli Hebrew as their daily language. Phonologically, this "dialect" may most accurately be described as an amalgam of pronunciations preserving Sephardic vowel sounds and some Ashkenazic consonant sounds with Yiddish-style influence, its recurring feature being simplification of differences among a wide array of pronunciations. This simplifying tendency also accounts for the collapse of the Ashkenazic [t] and [s] allophones of ת‎ (/t/) into the single phone [t]. Most Sephardic and Mizrahi dialects share this feature, though some (such as those of Iraq and Yemen) differentiate between these two pronunciations as /t/ and /θ/. Within Israel, the pronunciation of Hebrew, however, more often reflects the diasporic origin of the individual speaker, rather than the specific recommendations of the Academy. For this reason, over half the population pronounces ר‎ as [ʀ], (a uvular trill, as in Yiddish and some varieties of German) or as [ʁ] (a uvular fricative, as in French or many varieties of German), rather than as [r], an alveolar trill, as in Spanish. The pronunciation of this phoneme is often used among Israelis as a shibboleth, or determinant when ascertaining the national origin of perceived foreigners. There are mixed views on the status of the two dialects. On the one hand, prominent Israelis of Sephardic or Oriental origin are admired for the purity of their speech and Yemenite Jews are often used as newsreaders. On the other hand, the speech of middle-class Ashkenazim is regarded as having a certain Central European sophistication, and many speakers of Mizrahi origin have moved nearer to this version of Standard Hebrew, in some cases even adopting the uvular resh. It was formerly the case that the inhabitants of the north of Israel pronounced bet rafe (bet without dagesh) as /b/ in accordance with the conservative Sephardic pronunciation. This was regarded as rustic and has since disappeared. It is still said that one can tell an inhabitant of Jerusalem by the pronunciation of the word for two hundred as "ma'atayim" (as distinct from "matayim", as heard elsewhere in the country). Aramaic is a North-West Semitic language, like Canaanite. Its name derives either from "Aram Naharayim" in Upper Mesopotamia or from "Aram", an ancient name for Syria. Various dialects of Aramaic coevolved with Hebrew throughout much of its history. The language of the Neo-Babylonian Empire was a dialect of Aramaic. The Persian Empire that captured Babylonia a few decades later adopted Imperial Aramaic as the official international language of the Persian Empire. The Israelite population, who had been exiled to Babylon from Jerusalem and its surrounding region of Judah, were allowed to return to Jerusalem to establish a Persian province, usually called Judea. Thus Aramaic became the administrative language for Judea when dealing with the rest of Persian Empire. The Aramaic script also evolved from the Canaanite script, but they diverged significantly. By the 1st century CE, the borrowed Aramaic script developed into the distinctive Hebrew square script (also known as Assyrian Script, Ktav Ashuri), extant in the Dead Sea Scrolls and similar to the script still in use today. By the early half of the 20th century, modern scholars reached a nearly unanimous opinion that Aramaic became a spoken language in the land of Israel by the start of Israel's Hellenistic Period in the 4th century BCE, and thus Hebrew ceased to function as a spoken language around the same time. However, during the latter half of the 20th century, accumulating archeological evidence and especially linguistic analysis of the Dead Sea Scrolls has qualified the previous consensus. Alongside Aramaic, Hebrew also flourished as a living spoken language. Hebrew flourished until near the end of the Roman Period, when it continued on as a literary language by the Byzantine Period in the 4th century CE. Although the survival of Hebrew as a spoken language until the Byzantine Period is well-known among Hebrew linguists, there remains a lag in awareness among some historians who do not necessarily keep up-to-speed with linguistic research and rely on outdated scholarship. Nevertheless, current understandings of the vigor of Hebrew are slowly but surely making their way through the academic literature. The Hebrew of the Dead Sea Scrolls distinguishes the Dead Sea Scroll Hebrew from the various dialects of Biblical Hebrew out of which it evolved: "This book presents the specific features of DSS Hebrew, emphasizing deviations from classical BH." The Oxford Dictionary of the Christian Church which once said, in 1958 in its first edition, that Hebrew "ceased to be a spoken language around the fourth century BC", now says, in 1997 in its third edition, that Hebrew "continued to be used as a spoken and written language in the New Testament period". An Introductory Grammar of Rabbinic Hebrew says, "It is generally believed that the Dead Sea Scrolls, specifically the Copper Scroll and also the Bar Kokhba letters, have furnished clear evidence of the popular character of MH [Mishnaic Hebrew]." And so on. Israeli scholars now tend to take it for granted that Hebrew as a spoken language is a feature of Palestine's Roman Period. The international language of Aramaic radiated into various regional dialects. In and around Palestine, various dialects of Old Western Aramaic emerged, including the Jewish dialect of Old Judean Aramaic during the Roman Period. Josephus Flavius initially wrote and published his book Jewish War in Old Judean Aramaic but later translated it into Koine Greek to publish it for the Roman imperial court. Unfortunately Josephus's Aramaic version does not survive. Following the destruction of Jerusalem and the Second Temple in 70 CE, the Jews gradually began to disperse from Jerusalem to foreign countries, especially after the Bar Kokhba War in 135 CE when the Romans turned Jerusalem into a pagan city named Aelia Capitolina. After the Bar Kokhba War in the 2nd century CE, the Jewish Palestinian Aramaic dialect emerged from obscurity out of the vicinity of Galilee to form one of the main dialects in the Western branch of Middle Aramaic. The Jerusalem Talmud (by the 5th century) used this Jewish Palestinian Aramaic, as did the Midrash Rabba (6th to 12th century). This dialect probably influenced the pronunciation of the 8th-century Tiberian Hebrew that vocalizes the Hebrew Bible. Meanwhile over in Babylon, the Babylonian Talmud (by the 7th century) used Jewish Middle Babylonian Aramaic, a Jewish dialect in the Eastern branch of Middle Aramaic. For centuries Jewish Babylonian remained the spoken language of Mesopotamian Jews and the Lishana Deni. In the area of Kurdistan, there is a modern Aramaic dialect descending from it that is still spoken by a few thousand Jews (and non-Jews), though it has largely given way to Arabic. Besides Jewish dialects of Aramaic, other languages are highly influenced by Hebrew, such as Yiddish, Ladino, Karaim and Judeo-Arabic. Although none is completely derived from Hebrew, they all make extensive use of Hebrew loanwords. The revival of Hebrew is often cited by proponents of International auxiliary languages as the best proof that languages long dead, with small communities, or modified or created artificially can become living languages used by a large number of people. Hebrew has two kinds of stress: on the last syllable (milra‘) and on the penultimate syllable (the one preceding the last, mil‘el). The former is more frequent. Specific rules connect the location of the stress with the length of the vowels in the last syllable. However, due to the fact that Israeli Hebrew does not distinguish between long and short vowels, these rules are not evident in everyday speech. They usually cannot be inferred from written text either, since usually vowels are not marked. The rules that specify the vowel length are different for verbs and nouns, which influences the stress; thus the mil‘el-stressed ókhel (="food") and milra‘-stressed okhèl (="eats", masculine) differ only in the length of the vowels (and are written identically if vowels are not marked). Little ambiguity exists, however, due to nouns and verbs having incompatible roles in normal sentences. This is, however, also true in English, in, for example, the English word "conduct," in its nominal and verbal forms. Many Israeli speakers have merged /ə/ into /e/, reducing the vowel phonemes to 5. In Biblical Hebrew, each vowel had three forms: short, long and interrupted (khataf). However, there is no audible distinction between the three in modern Israeli Hebrew, except that tsere is often pronounced [eɪ] as in Ashkenazi Hebrew. Hebrew is written with a special vowel called "shva". Depending on its context in a word, it can be pronounced in two ways, called resting ("nakh"), and moving ("na'"). The resting shva is silent, while the moving shva is pronounced /e/ in Israeli Hebrew (though it was traditionally /ə/) . One-letter words and particles are always attached to the following word. Such items include: the definite article ha (="the"); prepositions be (="in"), mi (="from"), le (="to"); conjunctions she (="that"), ke (="as", "like"), ve (="and"). The vowel that follows the letter thus attached depends in general on the beginning of the next word and the presence of a definite article which may be swallowed by the one-letter word. The rules for the prepositions are complicated and vary with the formality of speech. In most cases they are followed by a moving schwa, and for that reason they are pronounced as be, me and le. In more formal speech, if a preposition is put before a word which begins with a moving shva, then the preposition takes the vowel /i/ (and the initial consonant is weakened), but in colloquial speech these changes do not occur. For example, colloquial be-kfar (="in a village") becomes bi-khfar. If l or b are followed by the definite article ha, their vowel changes to /a/. Thus *be-ha-matos becomes ba-matos (="in the plane"). However it does not happen to m, therefore me-ha-matos is a valid form, which means "from the plane". The Hebrew word for consonants is ‘itsurim (עיצורים). The pairs /b, v/, /k, x/ and /p, f/ have historically been allophonic. In Modern Hebrew, however, all six sounds are phonemic, due to mergers involving formerly distinct sounds (/v/ merging with /w/, /k/ merging with /q/, /x/ merging with /ħ/), loss of consonant gemination (which formerly distinguished the stop members of the pairs from the fricatives when intervocalic), and the introduction of syllable-initial /f/ through foreign borrowings. Hebrew also has dagesh, a strengthening. There are two kinds of strengthenings: light (kal, known also as dagesh lene) and heavy (khazak or dagesh forte). There are two sub-categories of the heavy dagesh: structural heavy (khazak tavniti) and complementing heavy (khazak mashlim). The light affects the phonemes /b/ /k/ /p/ in the beginning of a word, or after a resting schwa. 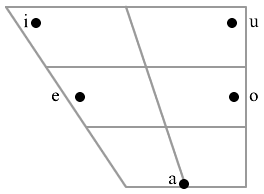 Structural heavy emphases belong to certain vowel patterns (mishkalim and binyanim; see the section on grammar below), and correspond originally to doubled consonants. Complementing strengthening is added when vowel assimilation takes place. As mentioned before, the emphasis influences which of a pair of (former) allophones is pronounced. Historical evidence indicates that /g/, /d/ and /t/ also used to have allophones marked by the presence or absence of dagesh kal: these have disappeared from modern Hebrew pronunciation though the distinction in writing still appears in fully pointed texts. All consonants except gutturals and /r/ may receive the heavy emphasis (dagesh khazak). Standard (non-Oriental) Israeli Hebrew (SIH) has undergone a number of splits and mergers in its development from Biblical Hebrew. BH /p/ had two allophones, [p] and [f]; the incorporation of loanwords into Modern Hebrew has probably resulted in a split, so that /p/ and /f/ are separate phonemes. Hebrew grammar is mostly analytic, expressing such forms as dative, ablative, and accusative using prepositional particles rather than grammatical cases. However, inflection does play an important role in the formation of the verbs and nouns. In particular, nouns have a construct state, called "smikhut", to denote the relationship of "belonging to": this is the converse of the genitive case of more inflected languages. Words in smikhut are often combined with hyphens. In modern speech, the use of the construct is sometimes interchangeable with the preposition "shel", meaning "of". There are many cases, however, where older declined forms are retained (especially in idiomatic expressions and the like), and "person"- enclitics are widely used to "decline" prepositions. Modern Hebrew is written from right to left using the Hebrew alphabet. Modern scripts are based on the "square" letter form. A similar system is used in handwriting, but the letters tend to be more circular in their character, and sometimes vary markedly from their printed equivalents. Biblical Hebrew text contains nothing but consonants and spaces, and most modern Hebrew texts contain only consonants, spaces and western-style punctuation. A pointing system ( nikkud, from the root word meaning "points" or "dots") developed around the 5th Century CE is used to indicate vowels and syllabic stresses in some religious books, and is almost always found in modern poetry, children's literature, and texts for beginning students of Hebrew. The system is also used sparingly when it is necessary to avoid certain ambiguities of meaning — such as when context is insufficient to distinguish between two identically spelled words — and in the transliteration of foreign names. All Hebrew consonant phonemes are represented by a single letter. Although a single letter might represent two phonemes — the letter "bet," for example, represents both /b/ and /v/ — the two sounds are always related "hard" ( plosive) and "soft" ( fricative) forms, their pronunciaton being very often determined by context. In fully pointed texts, the hard form normally has a dot, known as a dagesh, in its centre. The letters hei, vav and yud can represent consonantal sounds (/h/, /v/ and /i/, respectively) or serve as a markers for vowels. In the latter case, these letters are called "emot qria" (" matres lectionis" in Latin, "mothers of reading" in English). The letter hei at the end of a word usually indicates a final /a/, which in turn is usually indicative of feminine gender. Vav may represent /o/ or /u/, and yod may represent /i/. Sometimes a double yud is used for /ej/. In some modern Israeli texts, the letter alef is used to indicate long /a/ sounds in foreign names, particularly those of Arabic origin. Terminal syllabic emphasis is most common, penultimate emphasis being the only other official option. Fully pointed texts will note variations with a vertical line placed underneath the first consonant of the emphasized syllable, to the left of the vowel mark if there is one. Spoken Hebrew admits of more stress variation than the official dialect. The letter tsadi (צ) is transcribed as "ts" (although "tz", "z" or "s" is usually acceptable). The letter ayin (ע) is transcribed as ', the same as alef. In word-final position, this phoneme is always preceded by the vowel /a/. The letter shin (ש) is transcribed as "sh", and the letter sin as "s". Both the letter tav (ת) and the letter tet (ט) are transcribed as "t"
The letter khet (ח) is transcribed by "kh" (although "ch" or "h" is usually acceptable). The letter kuf (ק) is transcribed by "k" (although "q" is usually acceptable). The letter vav (ו) is transcribed as "v", but is omitted when mute. The letter yod (י) is transcribed as "y", but is omitted when mute. The letter he (ה) is transcribed as "h", but is omitted when mute at the end of a word. Syllable stress and shva are not marked. The vowels are always written in Roman transcriptions.